The research isn’t being developed to improve the welfare of the sows and piglets but to increase profits by achieving “optimal growth rate” in the piglets. Additionally reflective of the kind of mentality that created this problem, producers and researchers often blame the sow herself for her milk shortage. In pig producers’ unending search for increased profits, animal welfare often takes a back-seat. Take for example today’s sows, who have been genetically selected to produce unnaturally large litters. 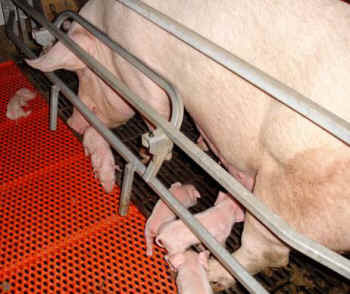 Called “hyperprolific”, these sows give birth to 16 to 18 piglets, compared to the eight to 10 of just 15 years ago. It turns out both litter sizes are abnormal to such an extent that the sows do not produce enough milk for all of the piglets. Farmer and other agribusiness researchers are now trying to make up for this short-sightedness by attempting to develop “low-cost” feeding and management strategies to increase sow milk yields. The research isn’t being developed to improve the welfare of the sows and piglets but to increase profits by achieving “optimal growth rate” in the piglets. Additionally reflective of the kind of mentality that created this problem, producers and researchers often blame the sow herself for her milk shortage. Here’s Dr. Farmer again: “…if you took a piglet and you gave it artificial milk on the side it would grow more so definitely the sow is limiting the growth rate of our suckling piglets”.